Unitone's R&D engineering team is responsible for the specifications and selection process used in determining the proper vendors of raw materials. Unitone and our vendor's engineering team work together on developing OEM reverse engineering and Unitone's matched component systems. The teams pre-test all incoming raw materials and simulate a critical printing environment to establish a superior and proven formulation. Once QC's stamp of approval is given by the teams, then materials are added to the Standard Operating Procedure (SOP). Raw material qualifications are established and documented by both the R&D and Vendor engineering teams. It is mandatory that all incoming raw materials are accompanied with qualifying documentation. The dedicated Quality Assurance team (QA), inspect and review all incoming materials against documentation. Any shipments that do not pass are automatically quarantined and returned to the supplier. This ensures that the product never reaches the production floor. Once all material and build process is documented by the R&D engineering team, they are then responsible for testing the performance of the build procedure against the OEM benchmarks and demanding the highest quality of standards available in the industry. After R&D engineers have passed the Build Process and SOP, R&D is responsible for training and testing all Supervisors and Leads. Once the Supervisors and Leads are trained and pass all tests, only then is the process passed on to the line operators. At this point all operators complete training and must pass all tests before they are allowed to fully implement the Build Process and SOP. Quality Assurance engineers (QA) are responsible for enforcing the SOP and perform continued documented audit procedures. They measure quality, tolerance and parameters set forth in the SOP. Additional random off the shelf inventory testing is performed and documented daily. They check for proper packaging, yield, density quality and overall cosmetics. The procedures are put in place and strictly followed to ensure the continued stability of all finish goods. Before reaching the packaging station the product has gone through numerous QC checks, post testing, and a complete detailing process. 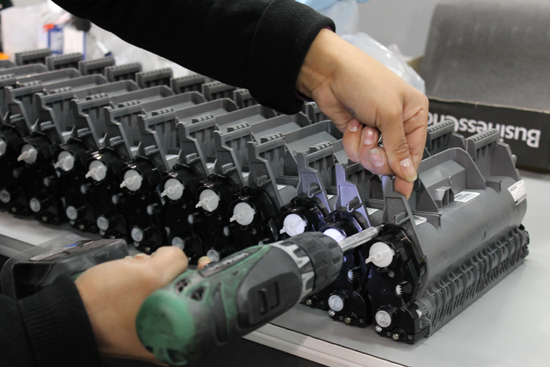 Once passed by QC, the product is then ready to be packed and shipped. Our product logistics department prides itself and is responsible for Unitone's 99% same day fulfillment rate as well as the accuracy of all standard and blind shipments. When it's all said and done, the only thing that really matters is that you the customer, experience the quality put forth into our finished product. Therefore Unitone has in place a customer survey form that grades our performance on all levels. We truly appreciate your honesty and thank you for your business and support.